Most art therapy sessions do not follow a concrete structure. Human problems and goals are always changing and therefore a flexible approach to therapy is important. Despite this necessary flexibility, therapists do have time limits for sessions and always have an aim in mind to improve a client’s mental health outcomes. As a result, putting some structure in place does help provide a framework in which both the therapist and client can feel confident that the sessions are productive. Sessions should hopefully be interesting and engaging for clients, yet also provide an expectation that the therapist has prepared to help the client through a process of treatment. Research has helped create benchmarks for clinical treatment for various client problems and as a result clinical skills and techniques have been developed in order to obtain the most effective course of treatment. 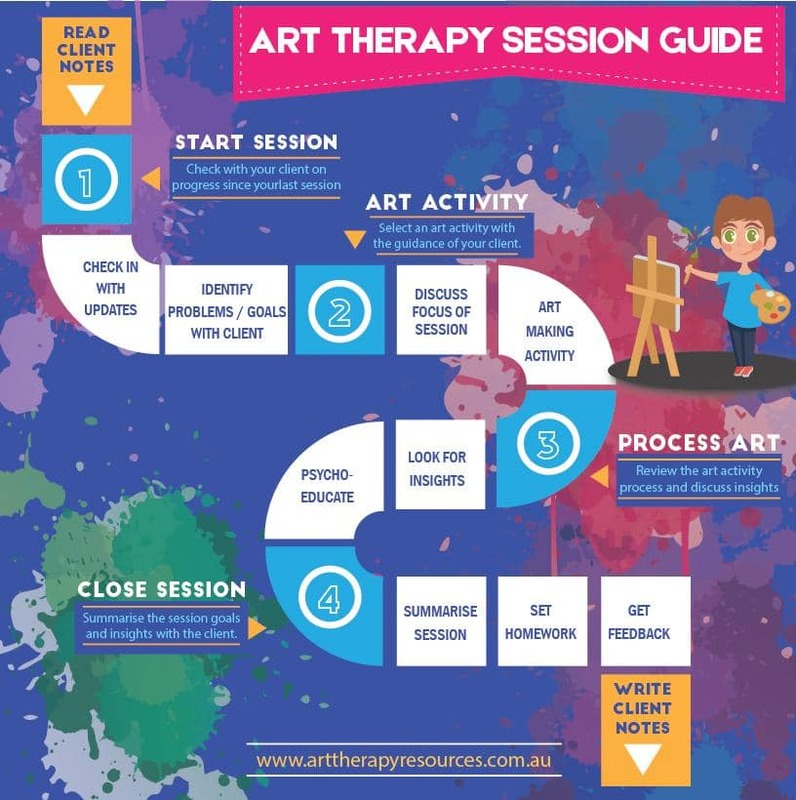 We have created a basic art therapy session guide to help art therapists create a framework on how to conduct a productive art therapy session. Most sessions begin and end outside of direct client contact as the therapist prepares for the session, and also completes session notes regarding the client’s treatment. Read on for a breakdown of the most significant parts of an art therapy session. As always, use your clinical skills and understanding of your client’s situation to construct a more personalised session for your client and their current situation. NEW CLIENT: if your client is attending for the first time, prepare any necessary client intake forms to record your client’s details. Review any notes taken about the client at the time the appointment was made so that you are prepared for the purpose of your client’s session. RETURNING CLIENT: If your client is continuing art therapy sessions, read over past client notes to reacquaint yourself with your client’s primary issues and goals. Gather any psychoeducation material you may wish to share with your client based on previous discussion. For example, you may have noted that your client wanted a prepared list of relaxation techniques to use in stressful situations. Psychoeducation educates your client about their mental health and empowers them with coping skills in their daily lives. NEW CLIENT: If your client is new, discuss your role and your approach to therapy. Your client will feel at ease if you are able to provide them with a basic guideline of the treatment process ahead. Ask your client about their primary reason for making an appointment and what they hope to achieve in their time with you. RETURNING CLIENT: Ask your client for any updates on previously discussed problems and determine if any issues have been resolved or continue to distress your client. Identify existing problems and discuss possible goals for your client to work towards in relation to those problems. As a therapist, your choice of art activity may often be diagnostic or therapeutic. While your client is making art, an important part of your role as an art therapist is to observe. Answer any questions your client may have throughout the process, however, attempt to be non-directive while the client is creating. 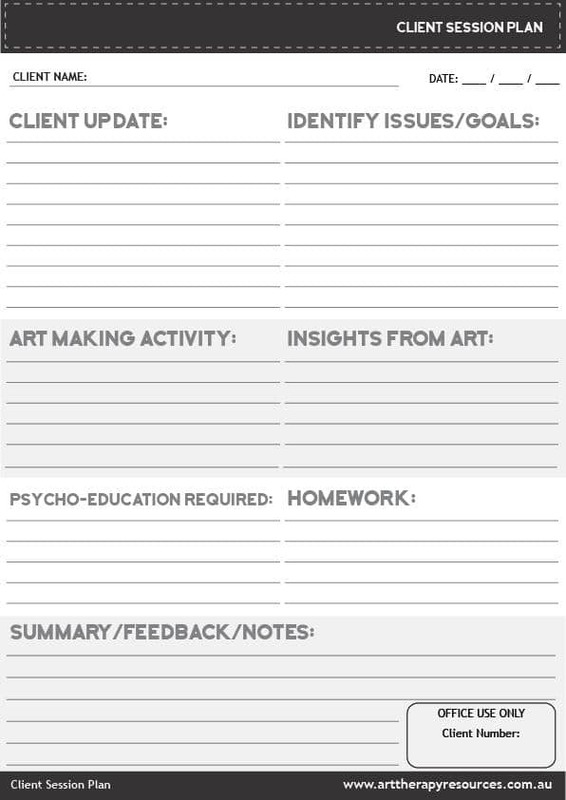 NEW CLIENT: Now that you’ve discussed your client’s main problems and goals, you will have an indication of an art activity that your client may benefit from. Initially, your client may need some education on the art therapy process. Determine how comfortable your client is with art supplies and discuss any possible resistance to using art supplies. Address the issue of perfectionism and place the focus on the process of creating instead of completing an artwork. Make sure your client understand the task as this will be the first time they have interacted with you. RETURNING CLIENT: Once you’ve discussed your client’s current problems and goals, discuss possible art activities that you think your client may benefit from in this session. Based on your knowledge of your client’s current state of mind, you may have some suggested activities for your client. Your client should already be familiar with your art supplies. Your client may need a reminder on perfectionism vs process when starting the art activity. Processing art for both new and returning clients involves the same steps. For new clients, it is important to explain that processing the art activity is not about interpreting the meaning of any images or outcomes but instead discussing the experience of the client during the activity. What thoughts came to mind for the client? Did they experience any confronting emotions throughout the process? You may want to ask if the art supplies used created any concerns for the client. Ask your client if the artwork that they created represents a memory or is a process of storytelling about a life experience in the past. Keep your questions open-ended and avoid projecting your ideas on to the meaning of the artwork. The activity of “processing art” is often similar to an interview where you are posing questions to the client that will help facilitate discussion and understanding. It is important to note that people are often critical of their own efforts and may make negative comments about their artwork. It is important to remind them again of the purpose of the art activity. Additionally, this self-criticism may provide you with insight into the client’s view of themselves regarding their self-esteem. Whether your client is new or returning, the final part of the art therapy session will involve the same process. Use this opportunity to summarise any key points from the session and invite your client to offer their own reflections on any insights they may have gained from the sessions. Discuss the option of any homework activities (not always necessary) and determine your client’s confidence in being able to achieve that goal before your next session. It is useful to ask your client for feedback on the art activity from the session. This includes seeking feedback on the art supplies used and any subsequent resistance or enthusiasm to starting the activity. Don’t forget to schedule your next session if necessary. For both new and returning clients, your post session time will involve writing your client session notes and making a note in your schedule to prepare anything you may need for future sessions. You will also want to store your client’s art and clean up your art space for your next session. Sign up to Download the FREE Client Session Plan Template below!